Arthouse Meath’s aim is to encourage a positive attitude towards people who are often marginalized. It presents the skills and talents of people living with physical & learning difficulties and complex epilepsy. 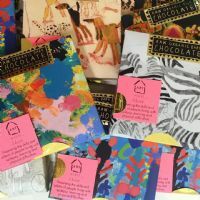 Their bold, quirky and colourful artwork is developed into saleable product packaging and wrapping paper. All work derives from the skills the artists bring to the enterprise and their contributions hold true value.